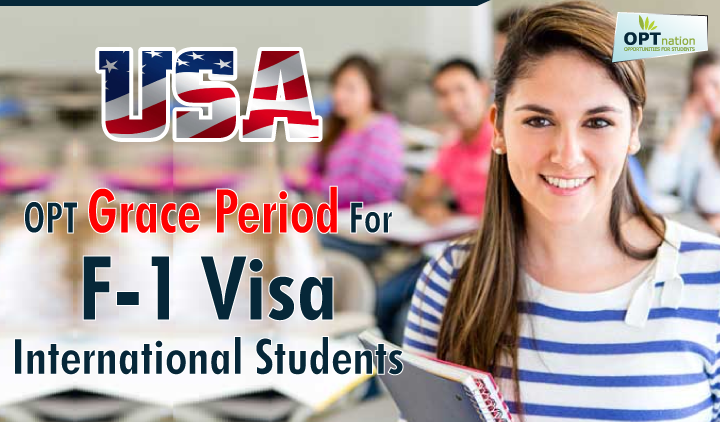 Grace period is the duration of time that is granted by USCIS to students on valid F1 / J1 visa status before completing 90 days of unemployment in order to take care of certain events, such as commencing a new program, transferring between schools, changing your status, starting a new program after work authorization or departing the United States. The Grace Period is authorized for up to 60 days for F1 students and up to 30 days for J1 status students. There is no grace period after 90/120 days of unemployment. Not being mindful of these grace periods can result in losing your status. The F1 visa grace period provides students a 60 day grace period during which they can stay in the United States beyond the completion of their program of study or Optional Practical Training (OPT). F1 students have to withdraw from the classes post receiving the authorization from International Student Services (ISS) which will only have a 15 day grace period to leave the US. However, F1 students who have withdrawn from the classes without previous authorization from ISS are provided with no grace period and must leave the US immediately. F1 students can find the details of completion of their studies on their Form I-120. The end date of the course that you’re studying will also be the last date for student status. Students studying in the USA on F1 Visa must be mindful about this grace period or it could cause them to fall out of status. OPT is temporary employment authorization for F1 students in degree programs to gain experience in jobs directly related to their major area of study. Students are allowed 90 days of unemployment while they are on valid post-completion OPT. Those who do not exceed 90 days of unemployment and report employment to the ISS are automatically given or granted a 60 day OPT grace period after the end date mentioned on the Employment Authorization Document (EAD). This only applies if you have successfully completed their OPT. If you are on post-completion OPT and have accrued more than 90 days of unemployment, you are considered out of status and are not eligible for the 60-day OPT grace period. There is no grace period after 90/120 days of unemployment. Depart the US. Once you leave the country after completing your studies and OPT period, you will be deemed ineligible to re-enter with your current I-20. You can travel within the states and prepare to leave the US during this grace period. You must request a new I-20 if you wish to continue at the UW in a new degree program. Undergraduates who are going to start their graduate studies will get a new I-20 issued by Graduate Admissions. If you are applying for OPT within your 60-day OPT grace period, USCIS must receive your application before you depart from the USCIS. If F-1 students who get an extension on their OPT employment based on the cap-gap relief, have their H1 B petition withdrawn or denied before the start of 1st October H-1B employment date, the student would have 10 days of employment authorization after the date of withdrawal or denial and 60 days to depart the U.S. or change status. Any violation of F-1 status leads to no grace period. Also, if the USCIS denies your H1-B visa application on the grounds of fraud or willful misrepresentation, then you’re not allowed to any grace period and should leave the country. The cap-gap benefit isn’t applicable to F-1 students after 1st October. If your H-1B visa application is denied after 1st October, then you no longer hold the permit for any grace period and must leave the USA. Students whose H-1B petition is denied before 1st October are permitted to 60 days extension. The cap-gap extension is offered to students for employment authorization and is the beneficiary when opting expired and H1B is pending or approved H1B visa petition. The J-1 Visa is a non-immigrant visa that offers cultural and educational exchange opportunities in the United States through a variety of programs overseen by the U.S and issued to research scholars, professors and exchange visitors participating in various programs. A government-approved sponsorship program will provide you with a completed DS-2019 form to be filed with the USCIS. These programs are sponsored by an educational or other nonprofit institution such as a university, private sector or government program which must be accredited through the Exchange Visitor Program designated by the U.S. State Department. 343,800 J-1 visas were issued in 2017. The USCIS allows J1 visa students for a 30 day Grace Period after successfully completing the Work and Travel Program. The J1 grace period starts from the last day of the program (as indicated on DS-2019). This period for you to settle your affairs, to travel within the country, prepare for your return trip to your home country and finally depart the U.S. During this 30-day period you are not allowed to continue to work. If you have extended or changed your program dates with US Administration valid approval, then you will have a maximum 30 days to depart the U.S. from the new program end date. Exchange Visitors are not permitted to continue their work, research or teaching on any exchange activities during your grace period whether with or without salary. Changing to another visa status. Many choose to spend the 30-day grace period sightseeing in the United States prior to returning to their home countries. If you choose to do this, please remember that once you cross the border into another country, your J-1 grace period is over and it is no longer possible to re-enter the U.S. with your J-1 visa. If your I-20 is terminated you’re granted a 60-day grace period. If your reinstatement takes longer than the 60 day grace period after completion of your program of study end, you will not be considered eligible for OPT. Apply for an H-1B visa if you have a Bachelor’s degree or advanced certification. Your employer must be willing to sponsor you. A J-1 visa is issued by USCIS to professors, researchers or exchange students. An academic institution, government or private business must sponsor the application and the work performed must be focused on teaching, consulting or carrying out research. If you’ve got the means and will to start a business you may be qualified for a permanent immigration visa. Extending your F-1 visa will help you remain in the US by enrolling for higher degree programs.